Picture from the 1900 Sanborn Fire Insurance Map. 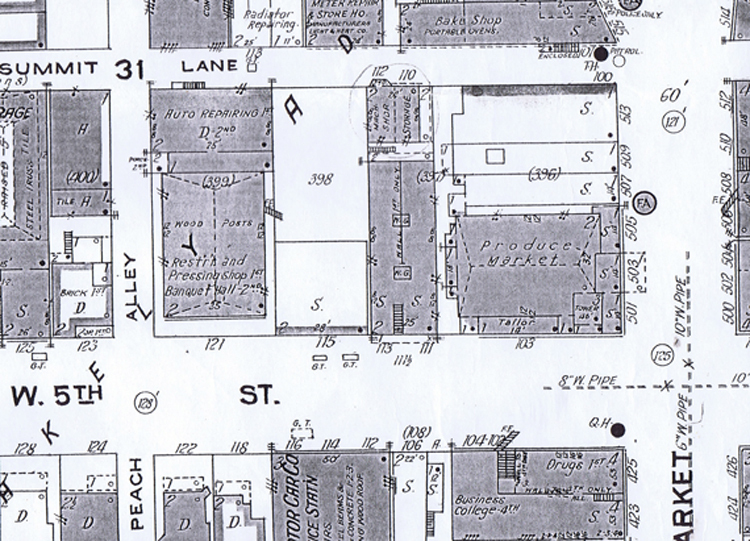 Picture from the 1913 Sanborn Fire Insurance Map. Picture from the 1923 Sanbron Fire Insurance map. The First United Presbyterian Church was organized in 1851-52. It was initially under the direction of the Associate Reformed Presbyterian Presbytery of Steubenville. It became a United Presbyterian congregation with the Union of the Churches in 1858. There were 18 original members: Alexander Young, George Anderson, Mrs. Isabel Anderson, Mrs. Mary Anderson, Nancy J. Anderson, William Blythe, Mrs. Harriet Blythe, William Dever, Mrs. Nancy Dever, Mrs. Mary Marks, Alfred B. Marks, Miss Ellivia Marks, Mrs. Finley, Miss Rebecca Finley, James McCormick, Mrs. Ellen McCormick and Mr. and Mrs. James Gibson. Rev. W. W. Clark, who had charge of a St. Clair Township church, was the first pastor. Rev. Thomas Andrews followed him, serving the Calcutta Church also. After him was Rev. J. W. Martin. In May, 1869 the Rev. J. C. Taggart assumed charge and for four decades directed the destinies of the constantly growing congregation. He began with supervision of but 95 members and was ordained in June of 1869. For a time the original members worshipped in the town's school house and other churches. 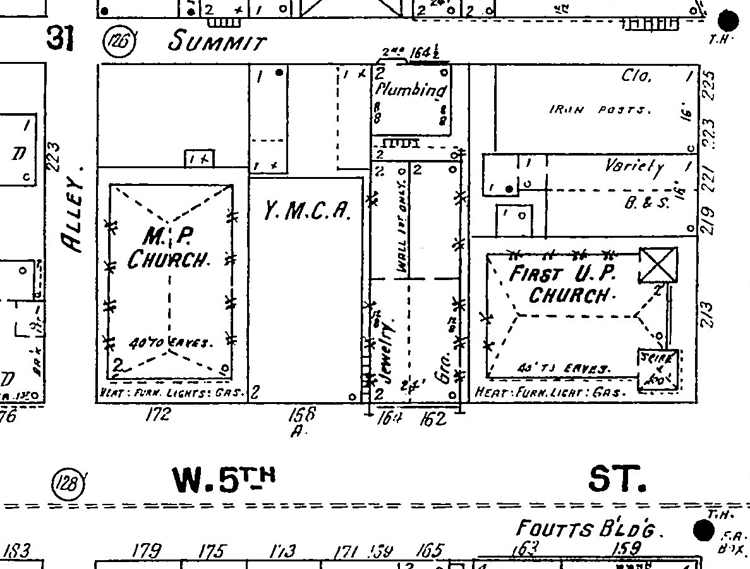 In 1854 a frame church building was erected at Fifth and Market streets on the present site of the Brookes Building. In 1876 across the street on the opposite corner a two-story brick edifice was erected which cost $16,000. It was dedicated in 1878. It was sold to the Citizens National Bank, and a more modern building of Vermont sandstone was built at Sixth and Jefferson streets at a cost of $95,000. With large auditorium, Sunday School and class rooms, pastors study, gallery and choir loft, a basement with kitchen, it has all the appointments that the times demand. It was dedicated on Jan. 5, 1907, the Rev. John Knox McClurkin of Pittsburg making the dedicatory address. When Dr. Taggart passed away he was succeeded by Rev. H. A. Kelsey, of Altoona, Pa., in 1910. He remained until 1916 and was followed by Rev. J. A. Speer, of Steubenville. The latter was succeeded in 1919 by the Rev. L. A. Davison, of Pittsburg, the present pastor. The church has a present membership of about 600 members. The Jefferson Street window of the new structure depicts "Christ in Gethsemene" and that on Sixth Street "The Good Shepherd." First United Presbyterian Church on the Northwest corner of Market and 5th Street. Looking along that side of the street to the west you see a building with a sign, looks like it could be Joseph Brothers painted on the side of the building. The building next to it is the Methodist Protestant Church. 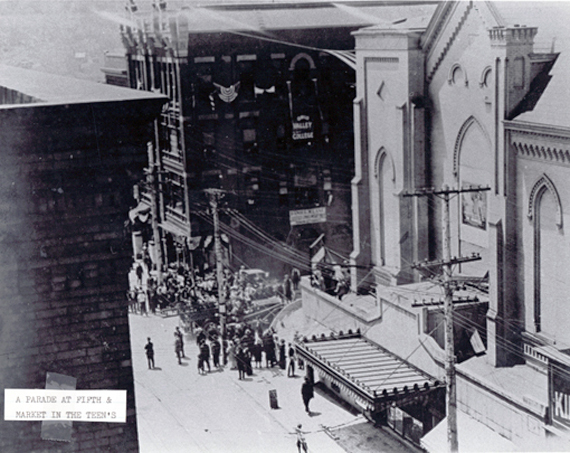 As the downtown business district developed, the members of the First United Presbyterian Church, located on the corner of Market and Fifth Streets, decided to move further west and build a new tabernacle on Jefferson Street. In 1907 the building was sold for a reported fifty thousand dollars and became the Bijou Theatre. The new vaudeville theatre occupied the second floor while the street level was divided into five retail outlets. On learning of the intended use of the former church, the leader of the congregation remarked, "Our sadness is turned into humiliation as we think of the uses that shall be made of this audience room where we have so often joined in the worship of the Holy One, and where, I trust, we have learned to love that which is pure and to hate every appearance of evil. When we think that this house shall be devoted to that which in many ways will teach lessons directly contrary to those which have been inculcated, we are grieved and heartily wish it might be otherwise." 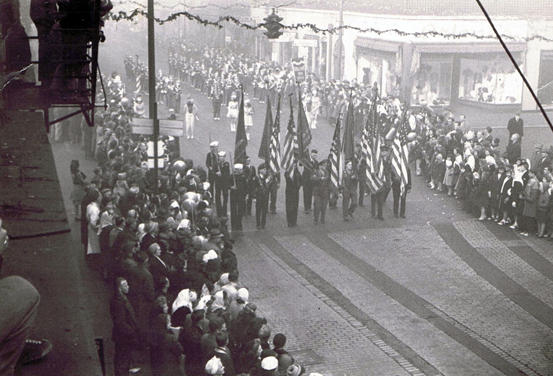 Lincoln Highway day June 4, 1915 parade. Corner of Market and Fifth Streets. On the right is the building that had been the First United Presbyterian Church. Now in 1915 the second floor was used as a theater. The first floor would have had retail shops. December 7, 1946. Fifth and Market Streets. Parade honoring Pearl Harbor. You can see the retail shops on the first floor of the former Church. The former First United Presbyterian Church Building. The movie being promoted showing at the Ceramic was The Two Mrs. Carrolls (1947). 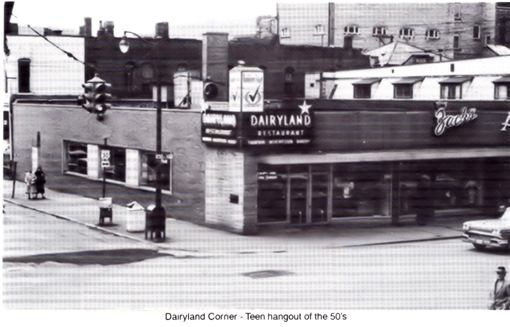 The original Dairyland before it was destroyed by fire in 1957. Further transformation. By the time Dairyland came into being the upper portions of the church had been removed. FYI the Dairyland picture is the "new" Dairyland. The original Dairyland was destroyed by fire and rebuilt. 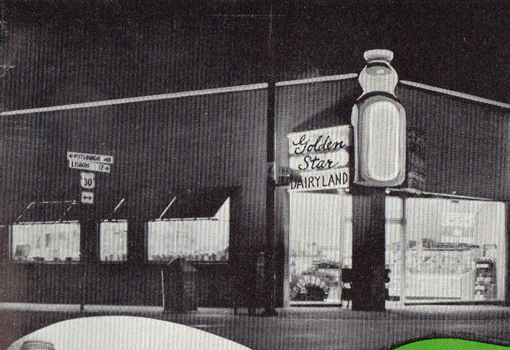 The original Dairyland had a glass bottle instead of the waxed Carton as in this picture. Thanks to Frank Dawson for allowing us to scan this picture from his book "We are the Potters" !00 Years of East Liverpool High School Football. A portion of the United Presbyterian still exists. 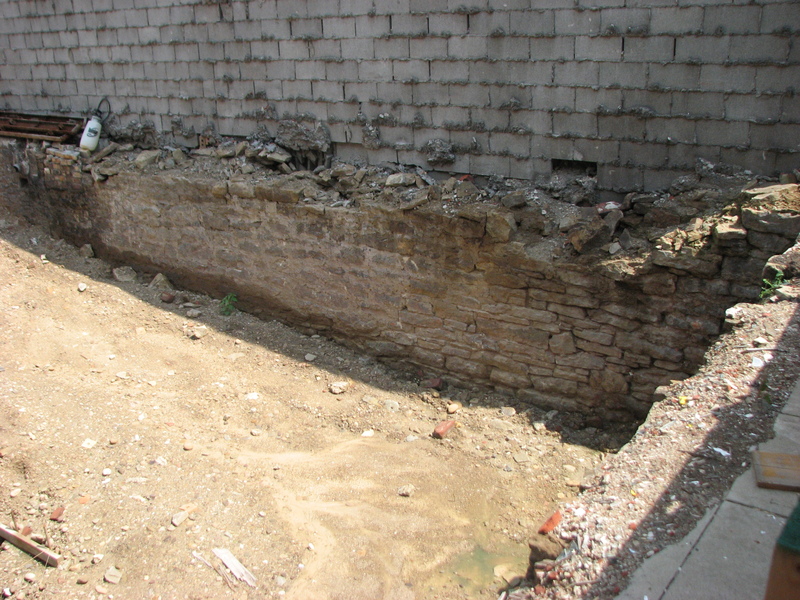 The original foundation was made visible when the building behind what is now the jewelry store, where Dairyland was, was torn down this past spring or early summer showing the church foundation is still there. 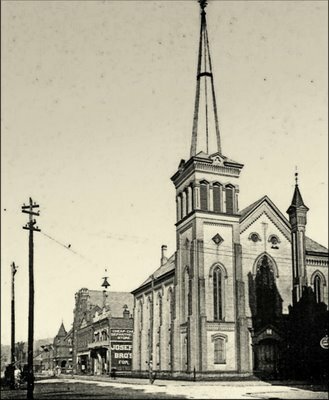 Around 1907 this congregation built a new Church on the Northwest corner of Jefferson and W 6th Streets. 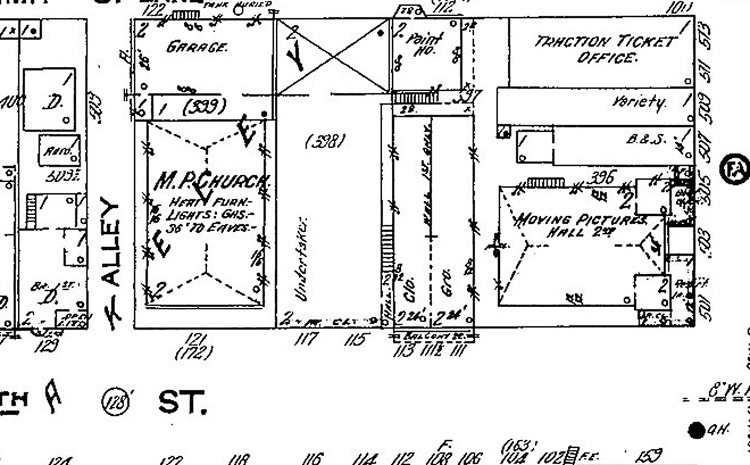 They sold the church building that was on the Northwest corner of Market and W 5th Street. The current First United Presbyterian Church. Another a little aside: first UP broadcast their services over local Radio, the only church in town to do so. My dad was the engineer that set that up every Sunday. The First Methodist Protestant Church was organized in May of 1855 with eleven members. For two years they worshipped in Bradshaw's Hall on Broadway. In that year the Sons of Temperance Hall on Fifth Street was purchased and in it the so-called "White Church" services were held for twenty years. In 1878 this building was torn down and a two-story brick edifice erected during the pastorate of Rev. J. B. Lucas at a cost of $10,000. This served the congregation until 1921 when a night fire made such damages to it that the members sold the property and built a modern church of imposing appearance with attractive equipment on Jackson Street. It has a large auditorium, Sunday School room, gallery, numerous class rooms, a basement with athletic arrangements, pastor's study and choir room. The new structure was erected with Rev. John Dimit as pastor. The building committee consisted of F. A. Smith, chairman, John Brookes, W. C. Todd, F. F. De Bolt, Joel B. Taylor, S. P. Ankrim, and Fred Kent. The dedication occurred on May 13, 1923, the dedicatory address being by Rev. Thomas H. Lewis, D. D., L. L. D., president of the General Conference of Washington, D. C., and was preceded by a week of special services. The cost of the structure and lot was $125,000. The first pastor of the church was Rev. E. A. Brindley. He was followed by Revs. William Hasting, George Burns, William Case, John Hodgkinson, J. H. Hall, Henry Palmer, J. B. Lucas, W. H. Gladden, R. B. Whitehead, C. F. Swift, Dr. David Jones, Dr.. George Sissen and John F. Dimit. The Rev. Mr. Dimit came to the church from a pastorate in Waynesburg, Pa., in 1909 and is now serving his seventeenth continuous year as pastor. In this interim he has himself conducted some outstanding revivals. The church has a membership of about 500 persons.